Do you want to disguise your thinning hair, yet don't yet feel ready for a wig? Or have you lost all your hair but found wigs uncomfortable and problematic to wear? Hair integration pieces can be the perfect solution. With loose-weave bases that let your skin breathe, they can be adapted for almost any style and can even be worn semi-permanently. Though more expensive, on average, than wigs, they're a great way to invest in your appearance. What Are Hair Integration Pieces? Hair integration pieces are an ancient form of hair substitution system. Long ago in China they were made out of silk, but today they are mostly nylon-based. They consist of a web or lattice which fits closely against the scalp, with any remaining hair drawn through the holes. Strands of substituted hair, real or artificial, are attached to this web, and can cover your head completely by themselves or mix with your own hair to give it added volume. Unlike Wigs, hair integration pieces don't have a sheet base, so you won't build up sweat underneath them and you're unlikely to be allergic to them. They are usually custom made and can be designed to fit across the whole head or just a portion of it, making them a great choice for people with Alopecia Areata. It is possible to fit them at home, though getting them fitted professionally in a salon will usually give better results and help them to last longer. Why Choose a Hair Integration Piece? Hair integration pieces have several advantages over wigs. They're highly adaptable, with a varying weave that can help you to adjust as your hair thins, without having to choose between all or nothing. They're much more comfortable for people who suffer from itching. They're usually lighter to wear, and they don't need to be attached with clips or glue. 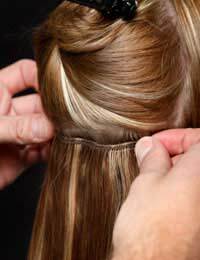 If you have no remaining hair to attach them to, they can be held securely in place with a light, comfortable tape. Probably the most common reason why people opt to use hair integration pieces is that they are so hard to distinguish from naturally growing hair. They can be colour matched so that the weave is invisible against your scalp and the hair attached to them exactly matches your own. You don't need to take them off at night (though some wearers prefer to), so a knock on the door early in the morning doesn't need to cause panic. You can look your best all of the time. Hair integration pieces can be cared for much like naturally growing hair. You can shower as usual (or even go swimming) without removing them, and you should shampoo and condition them like any other hair. Bear in mind that, because most hair loss conditions mean your scalp will produce less oil, you may need to use products designed for dry hair. The only real issue with hair integration pieces is that you cannot comb too close to your scalp. Hair should be held away from the head and combed section by section, though you should be okay running a soft brush across your scalp. If you are unfortunate enough to get headlice, you will need to remove your hair integration piece for the duration of your treatment. If properly cared for, hair integration pieces last between three and five years. It is possible for a skilled manufacturer to copy the weave and style of your existing piece exactly when it wears out, so that you can make a seamless transition and never have to be without attractive, natural looking hair. If you are considering buying a hairpiece, this site has information on Finding a Suitable Wig and tips on Wearing A Wig, too. I have thinning hair at the front and would like to know if there is a centre in Lancashire UK who I can contact as Iam really interested in hair integration as I find my thinning hair an embarrassing, and would like more info on cost etc. I would so grateful for any help I can get. With Regards, Elsie murphy.